Well we're down to the final day of sprucing up our spiritual trails for some good hiking, so to speak. I thank you for joining me for this work week. It's always more fun to clean, maintain and repair in the company of others than doing it solo. My goal here has been to do a little spiritual assessment and make those necessary alignments and repairs so that afterwards I can move forward spiritually at a more enjoyable pace while covering more and more ground. Sure, there's joy in the journey - beautiful vistas, challenging climbs, and breathtaking views - but we also want to make some progress! We want to get somewhere! So let's make a few final adjustments to our trails today and get on our way! If you're just joining us today, I'll let you in on our maintenance method real quickly. I'm just asking some questions that help us gauge the condition of our spiritual trails and then I'm supplying us with a few scriptures to help us make any necessary repairs. The goal is to honestly apply those scriptures so that the changes are made, not just to read them and think, "Well, isn't that dandy?" We gotta do the hard work folks, if we want to see any improvement in the trail. So heave ho! How's the signage on my trail? The markers? The maps? 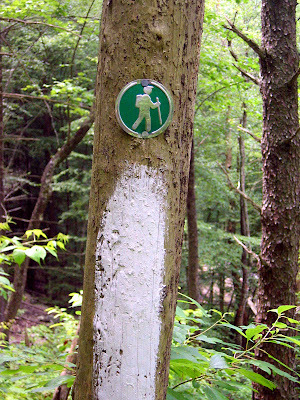 Do I have adequate guides on my trail to help point the way? Not only do I have them, but am I using them? Am I reading my Bible daily, allowing it to guide my steps, my decisions? For those times when I need a little direction quickly, have I been memorizing portions of scripture? Have I been meditating on it and letting it sink in? Am I taking part in a weekly Bible study or doing one on my on? How are the blazes on my trail? 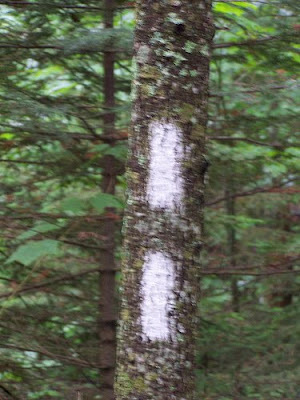 Trail blazes are usually a vertical dash of paint on a tree or rock or maybe a footprint of paint on a rocky trail. Blazes mark the right path so you don't make a wrong turn. They also tell you where you do need to turn and where to find shelter. Thing is, someone has to put those blazes there; they aren't natural phenomenon. Whether I think I'm a worthy guide or not, I'm blazing the trail for those who come after me. Am I marking the trail accurately for those who are following me? Am I leading them on a safe path that will get them to their ultimate destination? 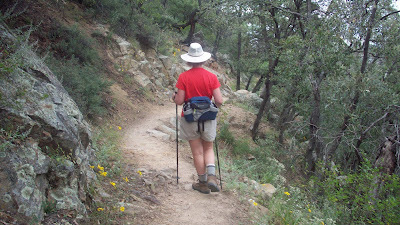 Do I need to adjust the blazes on my trail so that my children, my grandchildren, younger people in my church, young friends, and others who are watching me will be guided in the right direction? BIG responsibility! for in Christ Jesus I became your father through the gospel. I exhort you therefore, be imitators of me. and when you lie down and when you rise up. and they shall be as frontals on your forehead. Ok, once again I've supplied the tools, but it's up to you to do the work. Folks seriously. I've been on a lot of hiking trails. I love a good, well-maintained trail. It makes the hiking sweet, safe, and fun. 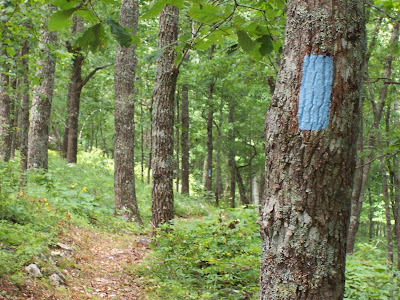 But a trail that hasn't been maintained in a while is full of logs that have fallen across the path, weeds (full of chiggers) that hide the path, and faded blazes that confuse even the best hikers. 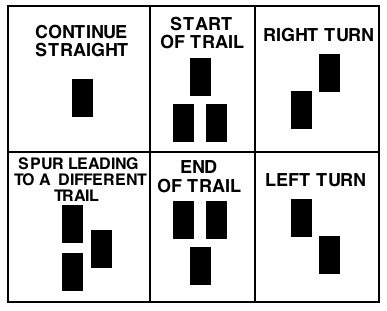 They're passable, but the chances of getting lost are heightened and your progress is definitely slowed. Our spiritual trails are similar in that they occasionally need a little maintenance. We have to stop and get rid of that which impedes our progress, that which trips us up over and over, and that which makes the path dangerous or dark. And we have to do whatever is necessary to make the trail a little safer, more enjoyable and fruitful, and easier to stay on. I've been on a spring break trip to California with my family this week. When I get back I plan to have a freshly maintained trail to continue my spiritual journey on. I'll be continuing to read the Bible through, I'll have some new scriptures to memorize, and I'll have a new resolve for my daily quiet time with God. What about you? What does your trail look like after a week of maintenance?